The super stars of the New Zealand eventing scene will have their time to shine at the Land Rover Horse of the Year Show on Friday morning, when the dressage takes place, followed by the cross-country on Saturday morning, and the final showjumping phase on Sunday morning. 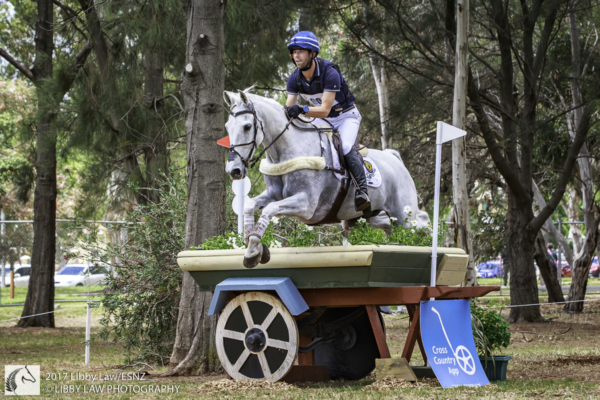 Clarke Johnstone and Balmoral Sensation, the 2016 Eventer of the Year, who went on to place sixth and best of the Kiwis at the Rio Olympics, heads a strong line-up of 23 entries in the CIC3* class vying for the 2018 title. This class is part of the year long ESNZ Eventing Super League series, so there is much at stake. An impressive line up of overseas officials will be judging this year, with the Ground Jury comprised of Christian Landolt, from Switzerland, and Annabel Scrimgeour from England, both of whom have judged at the highest level throughout the world. They are joined by Helen Christie, from Southland, who also has extensive overseas experience. The Course Designer this year is Chris Ross, from Helensville, who is making his mark with a number of highly regarded cross-country courses. He worked with the team who built the Olympic track at Rio, honing his chainsaw skills there. The Technical Delegate is Christian Persson, a Swedish Olympian during the eighties, who has officiated throughout Europe. The excitement of the Horse of the Year is great experience for these horses and riders, who are not normally exposed to the hype of big crowds at close quarters. Following last year’s cancellation, the interest in this year’s event is huge, with riders keen to test themselves in this unique environment. Two members of the successful team which won the Oceania Championships at the Melbourne International CCI3* at Werribee last July will be competing. Ginny Thompson has her team horse, Star Nouveau, who she plans to take to England shortly, and the promising Man of Honour, while Samantha Felton has three rides, including Ricker Ridge Escada, the current National Eventing Champion. Others to watch are Amanda Pottinger on Just Kidding, who will be hoping to push Clarke and “Ritchie” in the dressage phase, but will have to scamper to keep up with them across country, and Bundy Philpott, who won the Puhinui CCI3* on Tresca NZPH in December, and will be trying to produce that form again. Three members of the Oceania Young Rider team are testing themselves at this level. Renee Faulkner and Rubinstar HH, who produced a top performance at Puhinui and will be hoping for more of the same, while Jackson Bovill on Visionnaire and Abigail Long on Enzo will want to emulate her. There is also a big entry in the CIC2* class, including Greer Caddigan on Mr Mancini, who has an outstanding lead in the Mitavite Young Rider series, and Kate Herdson on Eon, the current Junior Rider champions. The 2* Ground Jury is Anne Tylee and Jenny Draper, both highly respected judges in New Zealand.